Tents provided by Reid Ranch are now offered for guests to stay in. These 8-person tents are placed on wooden platforms above the ground for a more even sleeping surface. Guests still bring their own sleeping supplies such as a sleeping bag and a pad or a cot; and their own towels. Guests get to participate in all the activities the Ranch has to offer as well as receive three western-style meals per day. When nature calls, guests also have access to restrooms with showers and flushed toilets. Reid Ranch staff will handle setting up the platforms and tents so guests have a hassle-free vacation. Staff may give additional instructions for care of tents during orientation. Guests will be assigned to at least one of four Tent City campgrounds depending on size of group. Camping at Reid Ranch is a great option for very large groups and groups on a budget. The wide open field on the Ranch’s plateau has plenty of space for tents. 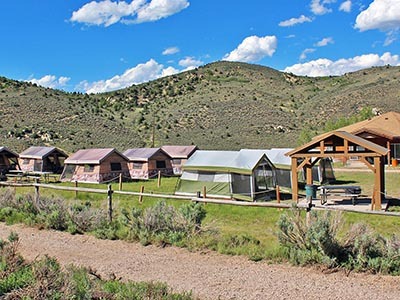 Guests who camp at Reid Ranch bring their own tents, sleeping supplies and towels, but they still get to participate in all the activities the Ranch has to offer as well as receive three western-style meals per day. When nature calls, guests also have access to restrooms with showers and flushed toilets. Guests will be assigned to at least one of three campgrounds depending on size of group.